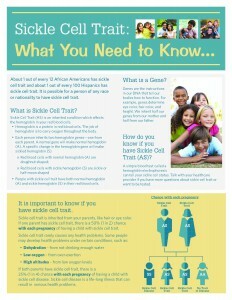 It is important to know if you have sickle cell trait. About 1 out of every 12 African Americans has sickle cell trait and about 1 out of every 100 Hispanics has sickle cell trait. It is possible for a person of any race or nationality to have sickle cell trait. The brochure and flyer linked below provide more information about sickle cell trait.